The death of a young businessman in Alexandria, Egypt, reportedly at the hands of two police officers, has led thousands to the streets in protest against police brutality, writes Tom Trewinnard. Since news of Khaled Said's death broke several weeks ago, gruesome pictures of his mutilated skull have appeared on many blogs and Facebook pages juxtaposed with images of Said looking youthful and fresh-faced - stark visual evidence lending credence to Said's family's allegations that their son was beaten to death by two local police officers. There is no justification for the alleged actions of the two police officers, who reportedly forced the victim's head against a marble counter in the cafe where they arrested him. This led to serious injury and intensive head bleeding. They then dragged him into the entrance of a nearby building and viciously attacked him, banging his head against a metal door and breaking his teeth, until he lost any ability to scream for help. لا يوجد ما يقنع أو يبرّر ما تردد أن يقوم اثنان من المخبرين بدفع رأس متّهم في شريحة رخامية داخل المحل الذي ذهب اثنان من المخبرين، للقبض عليه فيه ! وهو ما أدي إلي إصابته وتلطيخ وجهه بالدماء، ثمّ يقومان بسحله إلي داخل مدخل إحدي العمارات المجاورة ويضربانه بقسوة ويخبطان رأسه في الباب الحديد حتّي كسرت أسنانه وصمت نهائيّا وفقد حقّه في قدرته علي الصراخ . Unfortunately, reports issued by the police on the incident failed to present a logical explanation for the incident and the resulting death of Khaled Said. The police was more focused on portraying Khaled as a dangerous convict, drug addict, or someone who's evading military service. All this fails to answer the question: If we suppose this is all true, do these reasons justify taking his life away? The ball is now in Minister [of the Interior] Habib al-Adly's court, who should order an honest and just investigation in Khaled Said's incident. Strict penalties should be applied on the police officers who murdered him. This is the only way to mark a new beginning in the relationship between the police force and this country's youth, who will continue to demonstrate and attend drug rallies. This will continue to happen as long as our government insists on its current policies, without giving Egypt's youth any hope for changing their miserable reality. الكرة الآن فى ملعب اللواء حبيب العادلى الذى ينبغى ان يفتح تحقيقا أمينا ونزيها فى واقعة وفاة خالد سعيد، وتوقيع عقوبات رادعة ضد المخبرين اللذين تسببا فى وفاته، إذا ثبت ذلك، من أجل فتح صفحة جديدة فى علاقة الشرطة بشباب هذا الوطن الذين سيواصلون بالقطع مسيرة المظاهرات ومسيرة البانجو.. طالما استمرت حكوماتنا فى سياساتها الراهنة، دون ان تعطيهم أملا فى تغيير واقعهم البائس! This may be the first time in many years that Egyptians take to the streets in protest to internal affairs, apart from rallies conducted by Copts in protest to alleged discrimination endured by their families. This time, people have gathered as Egyptians to protest their country's affairs, away from any form of sectarianism. The people of Alexandria today taught ElBaradei and his supporters from the National Association for Change a hard lesson, with their absence from the political dramatics which he had prepared with his companions to take place at Sidi Gaber mosque, where he was claiming that millions would be waiting for him: The number of people present didn't exceed 400. أعطي السكندريون درسا قاسيا للبرادعي وأنصاره من جمعية التغيير بغيابهم عن المسرحية السياسية التي أعدها مع رفاقه بمسجد سيدي جابر حيث كان يروج أن الملايين سوف يكونون في انتظاره ولم يزد عدد من انتظره علي 400 شخص. 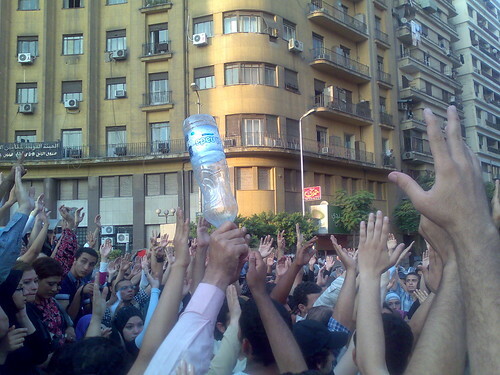 The protest witnessed the unification of different political movements against the emergency law, and portrayed the political scene in Egypt, depicting two different camps; the first, a regime which believes in isolated government; and the second, believing as a national power that believes in solidarity with civilians in confronting tyranny. Thanks to Ghaydaa, Yaser, Aya and Shaimaa for translations. You can add your view in two languages on http://news.Meedan.net.